Nanaimo newspaper letter draws First Nation's criticismThe Nanaimo Daily News is facing criticism once again this morning for its decision to publish a letter to the editor criticizing First Nations people. 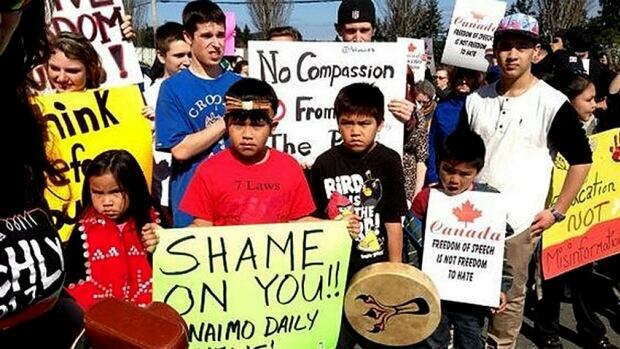 In the letter titled "No groups in Canada should get special status," Nanaimo resident Bill McRitchie writes "I always have difficulty coming to grips with the condemnation of 21st Century Canadians by aboriginals for injustice suffered in the 18th, 19th and early 20th century." Later he accuses aboriginals of clinging to their tribal system, and refusing to evolve as equal Canadian citizens. 1) "Special status" means equal status as governments. It's enshrined in the US constitution, if not the Canadian constitution. If you don't like it, amend the constitution or get the hell out of the country. 2) Natives mostly condemn Canadians and Americans for the injustices they experience today: inadequate funding, hostile court decisions, racism and stereotyping, etc. If the government and society tackled these problems, it would end many Native complaints. As for past injustices, many are due to broken treaties that are still "the supreme law of the land." Why should Indians accept the loss of their lands, minerals, or trust funds when the US and Canadian governments could reverse their decisions and start honoring the treaties? 3) Why do Americans cling to their Founding Fathers, religions, memorials, holidays, flags, guns, mascots, etc., etc.? Why don't they just get over things like the Civil War, Pearl Harbor, and 9/11? It's especially funny hearing the people who can't give up their racist words and images talk about Indians clinging to things. What they mean is, "Why don't nonwhites give up everything that makes them different and become white like us?" I posted a long rebuttal to the "cling" argument in Should Indians Cling to Reservations? Check it out. Beyond the specific arguments is the propriety of publishing a letter whose arguments have been discredited for decades. Would the Nanaimo Daily News also publish a letter saying Canada was founded as a white nation, blacks should know their place, or Jews are trying to take over? How is this letter any different? The only difference is that mainstream society doesn't challenge people's racist beliefs about Indians. It's still acceptable to say Indians are greedy for "special rights," angry over the "distant past," or incapable of being "equal citizens." All these are coded ways of saying Indians are still uncivilized and savage. For more on newspaper racism, see Racist Nanaimo Letter Sparks Outrage, Letter: Natives Aren't "Modern Citizens," and Racist Comments in Canadian Newspapers. Below: "Last May, the mayor of Nanaimo joined about 100 people protesting outside the offices of the Nanaimo Daily News after the paper published a letter to the editor that many found racist."